Back-flow incense burner creates an illusion of a smokey waterfall. This piece of art has lord Buddha sitting and meditating beside the waterfall. Simply place an incense cone at the top of the waterfall, and with the cone's special properties, the smoke starts to flow in reverse direction, that is from top to bottom, and in-turn creates a beautiful smokey waterfall. 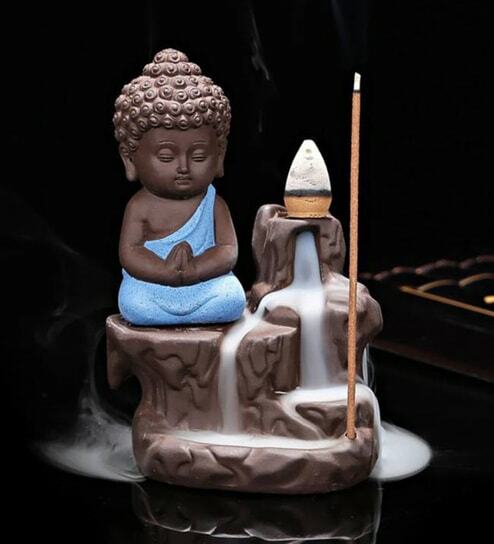 With scented smoke flowing in waves beside the Buddha, this makes the perfect housewarming gift for any home! Aspiration collection back-flow Buddha Incense burner comes with incense cones. This showpiece has been diligently handcrafted by skilled artisans of Aspiration collection using various traditional techniques. A one stop-shop for home decor and furniture, Pepperfry sells a home product every 30 seconds.